The latest videos of Reactors 2 and 3 at Fukushima I Nuclear Power Plant show steam rising from the locations where the reactors are located. The video of Reactor 3 was taken on August 24, and the video of Reactor 2 was taken on September 17 when the company sampled the air using the remote-control crane; a video camera was attached to the boom. You can download the zip files from TEPCO's Photos for Press page for your record (Reactor 3, Reactor 2), or you can view them here, courtesy of the Mainichi Shinbun video page. "Under the steam are the reactors. It could be either the steam is escaping from the reactor, or the rainwater is evaporating on the lid of the reactor which is hot." Looking at the videos, they do not look like rainwater being evaporated, as the steam comes out unevenly and sporadically. If it's rainwater I would imagine a steady rise of steam. First it was reported that "over 10,000 ppm" or over 1% of hydrogen gas was detected at 2 locations in the pipe that connects to the Containment Vessel of Reactor 1 at Fukushima I Nuclear Power Plant. Then it was allegedly "over 40,000 ppm" or 4%. According to Jiji Tsushin, TEPCO thinks the hydrogen gas concentration in the pipe may be 100%. 1,000,000 ppm. Concerning the detection of hydrogen gas in more than 1% concentration inside the pipe that connects to the Containment Vessel of Reactor 1 at Fukushia I Nuclear Power Plant, TEPCO announced on September 24 that it is highly probable that almost all the gas inside the pipe is hydrogen gas. TEPCO's Matsumoto said in the press conference, "Since there is no source for sparks, it cannot be said that there is a high risk of explosion immediately". According to TEPCO, they measured the gas at the pipe exit several times in the afternoon of September 23. Each time, the result showed "flammable gas including hydrogen gas, over 100% ". The company plans to use the instrument that only measures hydrogen, in order to accurately measure the concentration of hydrogen. It's so TEPCO. First they used the device that could only measure up to 10,000 ppm, and that maxed out. Then they apparently used the device that could only measure up to 40,000 ppm, and that maxed out. So they brought in a bit more powerful instrument, but it measures all flammable gases including hydrogen. I suppose they were hoping that one of these devices would suffice. But now, even they have admitted that the air inside the pipe may be 100% hydrogen. Just last night I reported on the hydrogen gas detected inside the pipe leading to the Reactor 1 Containment Vessel. TEPCO, according to the report and by their own press conference, said the density was "over 10,000 ppm". Well. It was an understatement if the worker who tweets from Fukushima I Nuke Plant is correct. He says they went back to test the locations again with the meter that can measure up to 40,000 ppm. The meter maxed out. It is over 40,000 ppm, or over 4%. The media and TEPCO reported the number as "over 10,000 ppm", which is technically correct. "Over 40,000 ppm" is definitely over 10,000 ppm. And today [September 23; they knew about "over 10,000 ppm" the day before] we went to measure using the meter that can measure up to 4%. It was 4% max. So the work [to cut the pipe] was canceled, and TEPCO made an announcement. I didn't know, as I'm not very knowledgeable about chemistry, but it seems there's a chance of explosion if hydrogen gas is more than 4%. He is wondering if zirconium cladding is still melting and reacting, producing hydrogen. But as one reader of this blog points out after putting two posts from yesterday together (the one about Reactor 4 SFP water radiolysis and the one about the hydrogen detection in the Reactor 1 CV pipe), it may be possible that the water radiolysis is happening somewhere deep inside the reactor building where boiling water is getting irradiated and generating hydrogen gas. Since the level exceeded 200 becquerels/kg, which is a standard used to determine whether more rigorous survey is necessary, the entire city of Nihonmatsu is designated as "special survey area", and 300 locations in the city will be tested instead of the planned 38 locations when the real survey starts. It is the first time a "special survey area" is designated. Radioactive cesium exceeding the standard (of 200 becquerels/kg for "special survey area") was found from the rice sample taken on September 12 from a location in Iwashiro District in Nihonmatsu City. The density of radioactive materials [cesium] in the soil in the rice paddy where the rice was harvested was 3,000 becquerels/kg. 18 other samples from the same city all tested below the standard. Old municipalities [now incorporated into a bigger city, as in the case of Iwashiro District] whose samples all test below the standard [200 becquerels/kg] in the preliminary survey will only need to test 2 samples per district, and if the 2 samples test below the standard the shipment of rice from the entire district will be allowed. In a "special survey area", 2 samples from every 15 hectares will be tested. If all samples test below the national provisional safety limit, then the shipment of rice from the district will be allowed. If one sample exceed the provisional safety limit, the shipment is banned for the entire district. In Japanese, this type of testing is called "ざる" - pronounced "za-ru" - sieve. It still caught 500 becquerels/kg cesium rice, to the dismay of Fukushima producers and the prefectural government. Speaking of hydrogen, TEPCO just announced it detected hydrogen at 2 locations inside the pipe that leads to the Containment Vessel of Reactor 1. They won't cut the pipe until the safety is assured. 10,000 ppm is equivalent to 1%. As we know from the previous post, if the hydrogen density is more than 4% in the air, a hydrogen explosion could happen. The company assures us, according to Yomiuri Shinbun, that the existence of hydrogen in the pipe had been expected, although the density was higher than expected, and that there would be no danger of an explosion. So if TEPCO says "more than 10,000 ppm", it either means they didn't bring the instrument that could measure higher than 10,000 ppm, or they don't want you to know how high. I wouldn't be surprised at either. We haven't heard anything more about the location near the exhaust stack for Reactors 1 and 2 that measured "more than 10 sieverts/hour". Was it 11 sieverts? 20 sieverts? 50 sieverts? It could be the same here in the pipe. "More than 10,000 ppm" could be 11,000 ppm, 20,000 ppm, or 40,000 ppm. TEPCO has been injecting nitrogen into the Containment Vessel since April, and it is considered there is hardly any oxygen that would be required for an explosion, according to the company. TEPCO says there is no immediate danger of explosion. Here we go again, "no immediate" danger. (Calling Mr. Edano...) That word makes me nervous. Besides, the very fact that the water being injected into the Reactor Pressure Vessel somehow ends up in the basement means the Containment Vessel is leaking badly. Nitrogen that's been injected since April is leaking, as the pressure doesn't go up at all. How would they know that there is hardly any hydrogen left? It could easily leak in from outside, couldn't it? and as it was revealed at the fall conference of the Atomic Energy Society of Japan on September 20, the water had to be boiling for that to happen. The article by Mainichi Shinbun on September 13 (linked below) summarizes the findings well enough. According to the article, the government researchers at Japan Atomic Energy Research and Development Agency and at Tokyo University announced the result of their analysis that the explosion of Reactor 4 reactor building at Fukushima I Nuclear Power Plant on March 15 may have been caused by a large amount of hydrogen gas produced by water radiolysis - dissociation of molecules by nuclear radiation in the Reactor 4 Spent Fuel Pool. An analysis by a team of researchers from Tokyo University and Japan Atomic Energy Agency shows that part of the reason for the explosion of Reactor 4 reactor building at Fukushima I Nuclear Power Plant was the large amount of hydrogen gas generated in the Spent Fuel Pool of Reactor 4. Radiation splits water and creates hydrogen. The analysis will be presented in the Atomic Energy Society of Japan's fall conference that will start in Kitakyushu City from September 19. The Reactor 4 Spent Fuel Pool contained 1,535 fuel rods, the most in the reactors at Fukushima that broke down. At the time of the March 11 earthquake/tsunami, the reactor had been stopped for the regular maintenance. But the tunami knocked out the power supply, which caused the loss of cooling, and the reactor building exploded on March 15, 4 days after the quake. In Reactors 1 and 3 which blew up in hydrogen explosions, it is considered that the fuel rods inside the reactors were damaged, which generated hydrogen. However, the fuel rods from Reactor 4 did not have noticeable damages. TEPCO suspects that hydrogen gas from Reactor 3, which shares the exhaust stack with the Reactor 4, flew through to Reactor 4, causing the explosion in Reactor 4. However, the team of researchers from Tokyo University and JAEA looked at the 20-hour gap between the explosions of Reactor 3 and 4, and suspected there are some other causes for the explosion [of Reactor 4]. The team irradiated the water in a flask at room temperature, at 97 degrees Celsius, and at boiling temperature and measured the density of hydrogen generated. At 97 degrees Celsius, the density was 1.5 times as much as at room temperature, and at boiling temperature the density was 100 times as much as at room temperature. If the density of hydrogen in the air exceed 4%, there's a danger of explosion. Vapor that went to the upper floors of the reactor building would have been cooled by the walls and condensed into water again, but hydrogen may have remained gaseous, increasing the ratio of hydrogen in the air. Professor Yosuke Katsumura of Tokyo University (radiation chemistry), one of the team members, says "Water radiolysis may have happened in addition to the hydrogen flow from Reactor 3. We would like to test whether it can happen in an actual reactor building with a real-size spent fuel pool". TEPCO says, "It is possible in theory, but we do not know whether a large enough amount of hydrogen is generated that way to cause an explosion". after they treat the water to remove as much radioactive materials and salt as possible from the water. TEPCO seems to be running out of storage space for contaminated water, and at the same time is worried that the wood piles may catch fire after the trees were cut down to make room for storage facilities on the west side of the plant. TEPCO disclosed the plan on September 22 to treat the low-contamination water and sprinkle the treated water in the Fukushima I Nuke Plant compound. The low-contamination water came from Reactors 5 and 6, and is currently stored in temporary storage facilities. The company says there will be hardly any effect to the surrounding environment, but there may be objections from the local municipalities. In Reactors 5 and 6, a large amount of seawater flowed into the turbine buildings and other buildings when the tsumani hit. In addition, rainwater and the groundwater have seeped in. TEPCO has been transferring this low-contamination water to the temporary storage tanks and to the "Megafloat", and there are currently 16,350 tonnes. Tepco has been clearing the forest inside the compound in order to set up the temporary storage tanks. The company is planning to sprinkle the treated water on the wood piles and the surrounding areas to prevent the wood piles from catching fire and to suppress the dust. The water will be treated to reduce the density of radioactive materials to the level allowed for the ocean bathing (50 becquerels/liter and below for radioactive cesium), and be desalinated. Asahi Shinbun has the information on how "low" the contamination is in this water, and it is 0.01 becquerel/ milliliter (= cubic centimeter). So, in one liter the density is 10 becquerels/liter. If both newspapers are right, then TEPCO will only have to do the desalination. according to a government researcher at Japan Atomic Energy Agency (JAEA). I see. So when the water source was switched from the tank to the suppression pool, the pressure didn't rise because the Containment Vessel already had a hole in it. Then the suppression pool blew up on March 15. The article doesn't say where the hole might be, or exactly when it may have been created and how. Al Jazeera's Steve Chao reported on September 17. He first meets Kouta Kinoshita, an independent journalist whom I have quoted several times here and who has been spearheading the grassroots effort to measure the radiation levels in many parts of Tohoku, Kanto, and now in Chubu and Kansai and beyond. He has also urged from the beginning of the crisis for people to leave Tohoku and Kanto, including Tokyo, as the contamination levels there are much more grave than the national or municipal government has admitted. In the interview, he says there are many spots in the Tokyo Metropolitan area where the radiation levels exceed those in Chernobyl where people had to evacuate. Kinoshita's blog (in Japanese) is full of anecdotal but excellent information of change in people's health in various parts of Japan. Some of them may be just rumors, but many write their own experiences in the comment sections. Then a mother and her young daughter who live in Tokyo. She says her daughter has been having symptoms that she never had before the accident: severe joint pains, fatigue, deep rings under her eyes, diarrhea. The mother says the daughter got better right away when they temporarily moved from Tokyo for the summer. Then he goes to see one of the government researcher, Toru Kikuchi, sporting his glass badge for radiation monitoring, who assures him and the Al Jazeera audience that it's all just psychological, and that the radiation is not much different from before the accident. Kikuchi is with the Jichi Medical University Radioisotope Center. Jichi Medical University is a private university, but Al Jazeera is excused for calling him "government" researcher as he has helped the government promote the notion that it's all in people's head, the radiation. It looks like he is another "space alien" politician. Might as well, as he made his name during the "space alien" Hatoyama administration. Spreading the radioactive lumber from disaster-affected area using the "eco-point" system is not enough for him. He has to spread the gospel of wonderful world of nuke and resulting wonderful world of decontamination to the developing nations throughout the world. Seiji Maehara, chairman of the policy bureau of the Democratic Party of Japan, was interviewed by reporters on September 21. Maehara said, "The trust in the safety of the Japanese-made nuclear power plants hasn't diminished. We must continue the export", indicating the Noda administration's plan to continue to promote the export of nuclear power plants from Japan. As the Minister of Foreign Affairs under the previous Kan administration, Maehara was instrumental in exporting nuclear power plants to countries like Vietnam. After the Fukushima I Nuclear Power Plant accident, Maehara pointed out, "It's a good timing to pursue higher degrees of safety. We have an obligation to enhance our nuclear technology by investigating the cause of the accident and establishing measures to prevent the accident from happening again, and to spread the technology worldwide". It sounds like part of instructions he may have received from his US counterparts earlier in September when he visited the US. On that occasion, he also expressed the Noda administration's intention to consider arms export from Japan, among other hawkish comments concerning Japan's Self Defense Force. PM Noda followed that up with his UN address by saying Japan would continue to need nuclear power. In my opinion, the Japanese anti-nuke protesters should focus their attack. 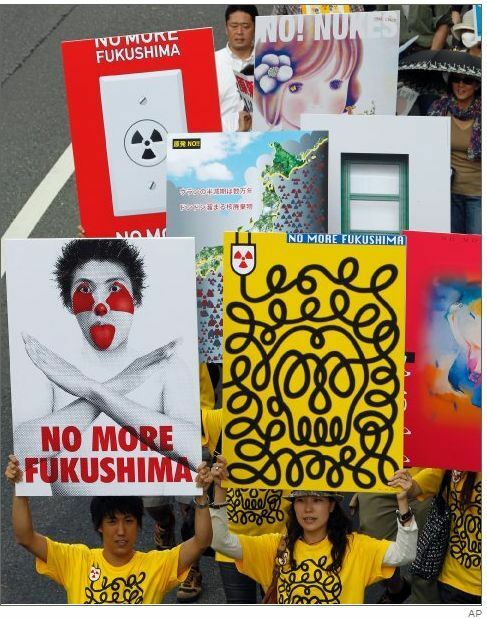 Instead of shouting slogans like "anti-nuke" or "beyond nuke" or "post nuke"; they should say "Prime Minster Noda, stop nuclear plants in Japan and do not promote the Japanese nuke industry with our tax money", "Mr. Maehara, you do not represent our views and you don't even have a public office other than as the Representative from Kyoto in the Lower House. Please shut up." The chairman of the policy bureau of the Democratic Party of Japan is just that, a party position, not the government position. The Typhoon 15 quickened the pace and traveled through Honshu and then Hokkaido, all's clear. Fuku-Ichi Hotel, aka Fukushima I Nuclear Power Plant survived. Not much rain and wind as had been feared. TEPCO announced on September 21 that due to the approaching Typoon No.15 the water levels in the turbine buildings for Reactor 2, 3 and 4 rose by 13 to 18 millimeters in 9 hours from 7AM to 4PM. At the current rate, there is no fear of contaminated water overflowing, according to TEPCO. Meanwhile, a leak of water at 4 tonnes/hour was found in the basement of Reactor 6 turbine building. It is considered to be the rainwater. Leaks were also found in the rooms near the central control room for Reactor 1 and 2. TEPCO is carefully monitoring the situation. Someone used "Hotel California" (by the Eagles) and turned into a satirical song about "Hotel Fuku-Ichi", aka Fukushima I Nuclear Power Plant. It's an accompaniment with beautiful shots of the "Fuku-Ichi" hotel, and the words come up like a karaoke screen for you to sing. The author of the video also has "Smoke on the Water" parody on Fuku-Ichi. "Smoke on the water, and fire in the sky..." That part he didn't even need to change the words. 200 to 500 tonnes of groundwater per day to the basements of reactor buildings and turbine buildings of Reactors 1, 2, 3 and 4. Of that 87,000 tonnes, estimated 47,000 tonnes were recirculated back into the reactors, leaving 40,000 tonnes of water to have been coming from somewhere. TEPCO now admits that the rainwater contribution to this amount is only a small portion, and most is from groundwater. 40,000 tonnes divided by 180 days equals is 222 tonnes. Hmmm. Where did that 500 tonnes per day number come from? Or so it looks like, though no MSMs in Japan dare mention that. Here's the map from Yahoo Japan typhoon information, and the location of Fukushima I Nuke Plant is marked with an arrow (courtesy of Savechild.net). The expected path of the typhoon looks almost directly over the plant. According to NHK Kabun tweet, rainfall in 24-hour period in Shikoku, Kinki and Tokai region is between 300 to 400 millimeters (11.8 to 15.7 inches). Rainfall in Tohoku is exceeding 150 millimeters (5.9 inches). NHK Kabun is also warning about storm surge in the coastal areas. There are other nuke plants to worry about along the way, most notably Hamaoka Nuke Plant in Shizuoka Prefecture whose reactors somehow managed the "cold shutdown". From Fukushima I, we know that all it takes for a serious accident to happen at a nuke plant is for the cooling of the reactors to stop. If the power supply somehow get disrupted along with disruption in transport long enough (landslide anyone? ), and the backup generators run out of diesel and backup batteries to simply die and they are not resupplied, well it doesn't need a Great Tokai Earthquake to wreck the plant, does it? For those of you in Japan and don't read the language and wondering how to get to Fairewinds Associates' English site at all, you can follow this link and see their latest video on Youtube. 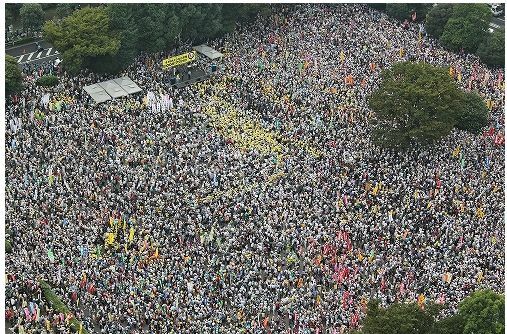 Photographs of 60,000-Strong Anti-Nuke Demonstration in Tokyo: Japanese MSMs Called It "A Parade"
Looking at this aerial photographs taken by Mainichi Shinbun (one of the better ones in terms of even coverage on nuke issues in Japan; another is Tokyo Shinbun), it sure looks more than 60,000 to me. People who actually participated in the event seemed to have the same impression as mine (on this blog comment sections, and on twitter), that it was far bigger than official number by the police (30,000). and the US paper Forbes, without photo, says "tens of thousands of people marched", but the article title declares "Thousands march against nuclear power in Tokyo". Thousands?? Many participants in Japan are indignant that their demonstration was called a "parade", as if this was some festival attraction. Well, give the media time to learn. To me, it's amazing that the MSMs like Yomiuri and Asahi covered the event at all, and even had photographs. Asahi and Mainichi sent in their own photographers for the event. (Yomiuri's looks like Jiji Tsushin's photo.) I would take it as a sign that the anti-nuke movement may be crossing the threshold in Japan in terms of the number of people, and the MSMs cannot simply ignore anymore. Calling it a "parade" and using the lowest official estimate by the police as the number of participants is a classic way to belittle a movement. 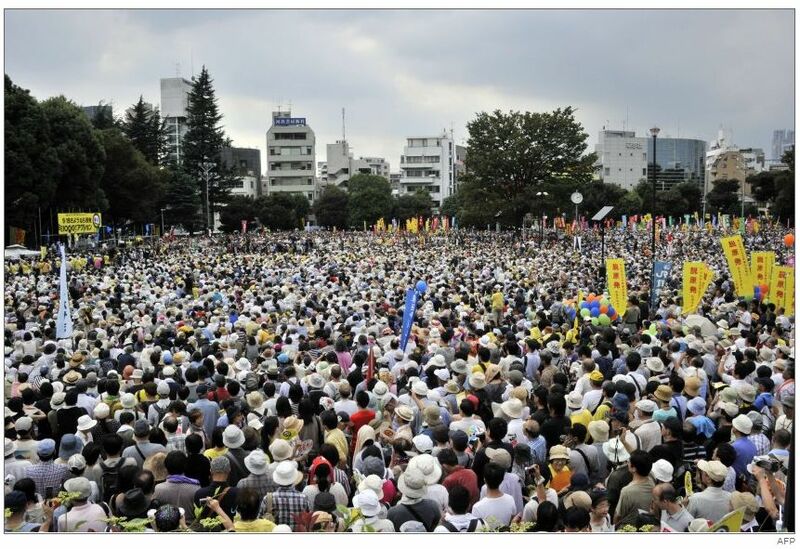 60,000-Strong Anti-Nuke Rally in Tokyo: How High Was the Radiation Level? One demonstrator got curious and turned his personal survey meters on from his home in the high radiation Kashiwa City in Chiba Prefecture to the rally in central Tokyo. 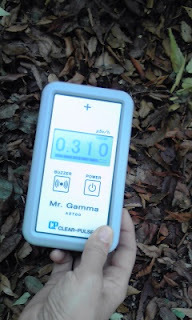 He found that right by the sidewalk where smartly dressed young people were walking by, the radiation level near the ground under a tree was 0.31 microsievert/hour. It was about 30 meters from the Jingu-mae Intersection near Omote Sando, he said. The Tokyo Municipal government's official measurement is 0.06 microsievert/hour. On his blog, he called the experience "surreal", seeing the cheerful demonstrators and seeing the high number on his survey meter. Much as I admire people finally standing up, I wish there were more people like him, armed with personal survey meter and measuring everywhere. Personally, radiation contamination is a more pressing, immediate problem that people can still do something about it, while stopping the nuke plants is a longer-term project. Goshi Hosono, Minister in charge of nuclear accident, gave a speech at the annual meeting of IAEA in Vienna, Austria on September 19, and said his government was planning to achieve the "step 2" of the Fukushima I Nuclear Power Plant "Roadmap" - cold shutdown of the reactors - by the end of this year instead of by the middle of January next year. He also announced the plan to receive the decontamination survey team from IAEA in October, in order to get their international expertise and knowledge about decontamination. Mr. Hosono said in the address, "The accident is steadily winding down. We will be doing our best to achieve the "step 2" by the end of this year, ahead of schedule". According to the "roadmap", the achievement of cold shutdown is set as the condition for the completion of the "step 2", where the reactors are stopped in a stable manner. It is to be achieved sometime between mid October and mid January next year. Does IAEA have decontamination experts? So the Japanese government is slowly changing the definition of "cold shutdown". The indicator of "cold shutdown" used to be the temperature of the RPV below 100 degrees Celsius, but now it seems they have added "in a stable manner". The temperatures of the RPVs of Reactor 1 and 3 measure less than 100 degrees these days, but "cold shutdown" is not declared. So the charade goes on, trying to achieve "cold shutdown" of what remains of a Reactor Pressure Vessel, probably long devoid of the molten jumble of fuel rods, control rods and everything else inside (corium). Even TEPCO admitted they are not 100% sure what they are measuring as temperature, pressure, and water level is accurate. Since he's in Vienna, Hosono may not know that TEPCO has admitted to several hundred tonnes of groundwater leaking into the basements of the reactor buildings and turbine buildings every day. I guess he can take the line from ex-chief Cabinet Secretary Edano (and current head of the Ministry of Economy and Trade) and say "Not an immediate problem". It worked for Edano. TEPCO finally admits, after confronted with the calculation by Tokyo Shinbun. To no surprise to anyone but TEPCO, the Japanese government, and probably the majority of the Japanese people, the basement walls and floors are likely to have cracked and been damaged during the earthquake. It's been revealed that there is a possibility that several hundred tonnes of groundwater may be flowing into the basements of reactor buildings and turbine buildings in Reactors 1 through 4 at Fukushima I Nuclear Power Plant. The amount of contaminated water should have decreased by now to slightly over 50,000 tonnes, based on the amount of water processed. However, there are still over 80,000 tonnes of highly contaminated water remaining in the basements. TEPCO has admitted to the possibility of groundwater flowing into the basements, whose walls may have been damaged in the earthquake and are letting in the water. This may affect the future work to wind down the accident. Tokyo Shinbun calculated the hypothetical amount of the remaining contaminated water, based on the data published by TEPCO on the amount of contaminated water transfer and the amount of water injection into the reactors. According to our calculation, about 100,000 tonnes of contaminated water should have been reduced to about 51,600 tonnes by September 13. However, the latest estimate by TEPCO from the actual water levels in the basements is 81,300 tonnes, leaving 30,000 tonnes or so gap from the calculated amount. So far, TEPCO has explained that the contaminated water is not decreasing as fast because of the rainwater. Around Fukushima I Nuclear Power Plant, there have been 3 heavy rainfalls since July. Part of the rain may have entered the buildings through the damaged rooftops. However, the contribution of rainwater to the water in the basements is not big enough to explain the 30,000 tonnes difference. It has been pointed out before that the groundwater may be flowing into the basements through cracks in the basement walls, and now that possibility is even more heightened. We showed the result of our calculation to TEPCO, and they answered "The water may be flowing in in the order of 100 tonnes per day". If the groundwater is indeed flowing into the basements, the amount of contaminated water to be treated will be further increased, necessitating the decrease of water being injected into the reactors. The work to wind down the accident may be affected in many ways. I don't know whether TEPCO means "100 tonnes per day per unit" or "100 tonnes per day per each building" or "100 tonnes per day at the plant". In the latest announcement on the contaminated water processing on September 14, TEPCO is processing about 1,500 tonnes per day. And what did the company do with the money? It deposited the money to the European Central Bank for safety and higher interest. How could an engineering company make a diposit at a central bank? Because Siemens does have a bank, for about a year. Siemens withdrew more than half-a-billion euros in cash deposits from a large French bank two weeks ago and transferred it to the European Central Bank, in a sign of how companies are seeking havens amid Europe’s sovereign debt crisis. The German industrial group withdrew the money partly because of concerns about the future financial health of the bank and partly to benefit from higher interest rates paid by the ECB, a person with direct knowledge of the matter told the Financial Times. That compares with an average overnight interest rate paid by eurozone banks of 0.95 per cent. It made the national news ONE MONTH AFTER a private citizen measured the air radiation level on his own and had the dirt tested with his own money. According to TV Asahi's "Morning Bird" news variety show on September 19, 63,000 becquerels/kg of radioactive cesium was detected from the dirt sediment on the rooftop of a 5-story apartment building in Kohoku-ku in Yokohama City. It is the same Kohoku-ku where 42,000 becquerels/kg of radioactive cesium was found near the side drain on the road. The person who measured the radiation tweeted the result as early as August 15. The show's commentators are saying "Oh... what about Tokyo? I thought we're safe." or so the organizers say. But the number of participants are likely to have exceeded the target of 50,000, as many who are on the scene are tweeting. I reported this already in late June, but now it's a formal request from Japan's Ministry of Foreign Affairs for the appropriation for the 3rd supplementary budget for the fiscal 2011. By "disaster-affected" areas, read Fukushima, Miyagi, and Iwate Prefectures. The purposes for this plan is two-fold, according to NHK. First, to aid the developing nations of course. Second and more importantly, to erase for once and for all the "baseless rumors" about radiation contamination of the Japanese produce and products in the minds of people in the developing nations. For the last one, the ministry is hiring 2 people with college or graduate degrees with English proficiency to tweet for the ministry, and take care of the Facebook/Twitter writers when they come to Tohoku. The ministry's elite bureaucrats seem to think the revolutions in the Middle East happened because of Facebook and Twitter. What they've decided to ignore is that they were used by the anti-regime protesters, not by the regimes.